As the name implies, the emphasis of this Immersion is to help you help yourself. We'll teach you simple tools so you know how to Allow yourself to Be, and to experience what that means. When you're caught in the complication or stress of life events, and you remember these arts, you'll have a greater chance to respond, rather than react. Step by step, you'll be able to verify the value of what you learn and experience. "On Your Own Two Feet" is both a training and a retreat and honestly, it's probably unlike any other journey you've ever taken. Consider it a seedbed for Gratitude. You'll learn dynamic Self-Breema exercises; yoga postures and practical philosphy suited to you; harmonizing Breema bodywork sequences, and meditation practices to help you see through the habitual patterns that keep us from actually tasting our lives. This immersion includes 70 hours of class time! Beginning in the spring and finishing in the autumn of 2019, this deeply-enriching program offers regular, intentional support for living a more fulfilling life. Because we meet periodically over many months, you'll have a lot of support to build your practice at home. You’ll also have opportunities to ask questions based on what you've been working with on the mat, on the cushion and in your day-to-day. The group serves as your unique community of fellow travellers - each participant's experiences contributing to the efforts of the whole. Since the group is kept small, (6 person maximum) you'll have the benefit of classes that are developed to best serve those who show up. Because of our emphasis on nurturing the whole person, you’ll build a foundation that will continue to support you. 3 One-Day Retreats (called "Support Days") are interspersed between the full weekend retreats. These meetings offer further class time (Breema workshops, Yoga and Meditation) and opportunities to ask questions. Between meetings, we will have simple homework that helps you integrate the principles and practices you’ll learn between sessions. Spiritually-enlivining poetry and prose will be offered as food for the journey. And speaking of food - lunch break will be potluck style (you carry in to share) to encourage community and fellowship and to sample what delicious, nutritious food your group-mates are creating at home. 2 Additional, 60 Minute Breema bodywork treatments. These treatments will be scheduled on Support Days or during Weekend Retreats. Breema treatments are transformational and decrystallize the body, enabling it to support you to become open-minded and open-hearted, and to receive the finer energy of Consciousness. Receiving these treatments from an experienced practitioner also supports you in how you do Breema yourself. Mutual Support! 1 day of our Annual Breema Retreat, with the option to add more class time during that retreat at a 50% discount. This yearly retreat draws both new and returning students and also gives you the opportunity to study Breema with visiting instructors from the Breema Center who co-instruct during this 3 Day Retreat. you to continue to grow and to connect with Yourself. connection to your daily life. • Yoga asana and philosophy that is practical, effective and nurturing. • A solid foundation in meditation or a renewal of your practice. • Inspirational quotes and readings that you can continue to come back to, again and again. • A community of new friends with a common interest and desire to really experience a delicious life. Dave and Alana Pratt are pioneers in leading retreats in the midwest, offering their home as a learning and healing space in the peaceful countryside of Holmes County, Ohio. Since the inception of True Nature in 2010, thousands of people have come alone or in small groups for treatments, classes and retreats. Visitors come to rekindle the spark of connection to their essential selves and to find new direction they can bring home. In addition to leading retreats, Dave and Alana see private clients and students throughout the year, and each of them draw on decades of experience in their practices. Read more about Dave and Alana here. Option 1: $1,850, plus tax or $1,750, plus tax if you pay in full by December 31st, 2018. Click here to pay now. 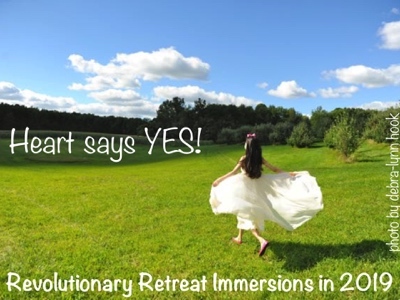 Option 2: Pay in three installments prior to our first retreat on May 17-19. (Your total will be $1,850, plus tax) Click here to make your first payment of $700. After choosing your payment option, use this link to submit a REGISTRATION FORM. Some hours from Breema classes in this immersion can be used towards Breema Practitioner Certification through the Breema Center in Oakland, California. CE Hours are also available for massage therapists and yoga instructors. and find all the barriers within yourself that you have built against it..."
"On Your Own Two Feet"